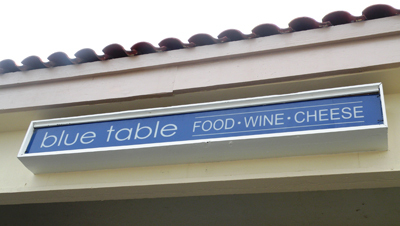 The fact that I even found blue table in Calabasas is what you might call a happy accident. I was hungry, driving around Calabasas and for some reason our car turned into a tucked away strip mall. I was so not sure about this place that my lunch date actually kept the car running while I popped inside. The four or so tables out on the front walk all filled with happy diners should have been my first clue. But once I stuck my head in the door and took in the scenery I gave my date the high sign. A communal table, two small bar height counters tucked into the front windows, shelves lined with wines, mustards and vinegars, a walk in cheese closet at the back and a black board filled with enticing salads, sandwiches and pizzas was what drew me in. I was pretty surprised at how packed this little place was, at how many people filed in and out in the course of about 30 minutes, another very good sign. We ordered our sandwiches, a bowl of soup and two glasses of the wine they were offering that day and snagged a couple spots at the communal table. 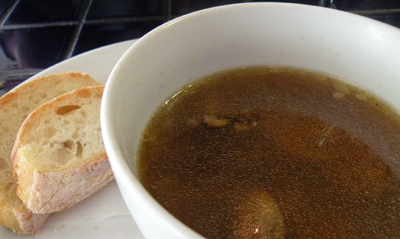 The mushroom and farro soup ($4.50) came out first. I was expecting a creamy soup so at first I was a little taken back. But the broth was meaty and the farro had a nutty flavor and a good texture. It needed a pinch of salt and pepper but it was light and flavorful none the less. Burrata, prosciutto and arugula sandwich. My favorite part about the Turkey Sandwich ($7) was the bread, soft on the inside but sturdy and crunchy on the outside. 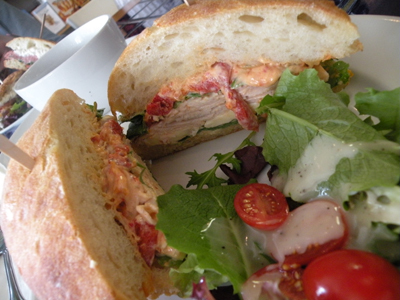 It held up well against the generous portions of brie, roasted red peppers, arugula and sun dried tomato aioli that accompanied the turkey. It was a generous portion and I happily tucked away one half of my sandwich in a to go box for later. 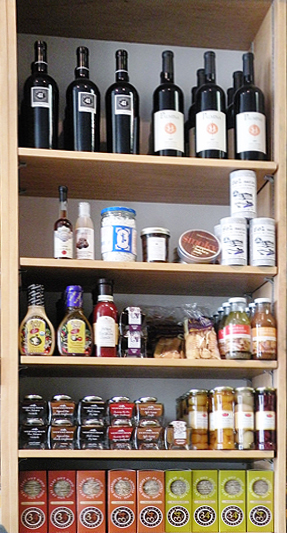 blue table is a family owned food store and eatery with wine, cheese and gourmet groceries — eat in or pick up to go. 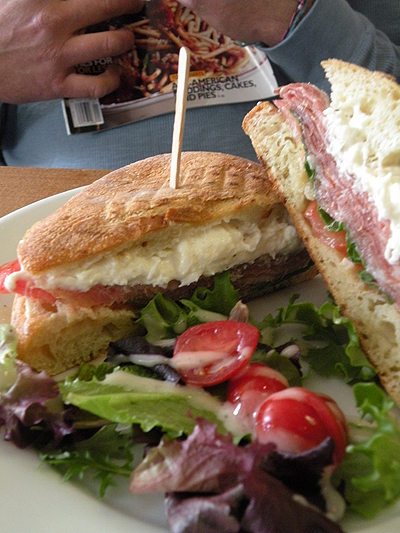 One of their specialties for the day was a sandwich that combined Burrata and prosciutto, also with arugula ($8). This one was a bit simpler without all the fanfare of the turkey sandwich but really, the Burrata was so fresh, gooey and creamy that is was the star and needed no back up. I didn’t get a chance to try the cheese plate they were offering, but the foursome next to us ordered one. It looked delicious and it took all my wherewithal not to lean over and ask for a sample. The service was a friendly if a bit scattered, but the manager, Brian, did take the time to chat with us and give us a little background on the wines we were drinking, which was nice. For as much hustle and bustle as there was in the shop, there was also a feeling that people were taking their time, enjoying their meals and working on another kind of time clock, as if once you stepped inside blue table, just for 30 minutes, you’re on vacation. A hidden gem in Calabasas. blue table 4474 Park Granada #4 Calabasas 91302 818.222.5195. Call for hours as they vary.